New start, character generator tables in 144 Bytes. Adam Fabio pointed out there could be a problem accepting 1kB challenge entry with HD44780 LCD, containing fair bit of character generator ROM. Though I have no problem with the HD44780, I&apos;ll try to rework my project to not use HD44780 or similar LCD driver with built-in character set - so, I have to use graphical LCD and construct character bitmaps from resources on my 1kB constrained FLASH. I&apos;m kinda stuck, as every single character needs 5 bytes of FLASH and there is at least 96 of them, and 480 Bytes just for character bitmaps is way too much for this project. But I&apos;m too stubborn to give up the display output. I could strip down the ASCII subset, but still, 170 Bytes is just 34 characters, not enough for alphabet and numbers, not to mention special symbols, so much used in BF. 64 or at least 56 characters would be better. That&apos;s still too much of FLASH consumed. I noticed that having full 8 bits for one character btmap column is too much luxury. That is 256 combinations and many (most?) of them are simply unused. I decided to create the 16 most versatile combinations of pixels (vectors), so I can encode two columns into single byte. If I&apos;d decrease symbol width to 4 columns (4x8 pixels characters) I can encode whole character into two bytes + 16 bytes of column vectors. 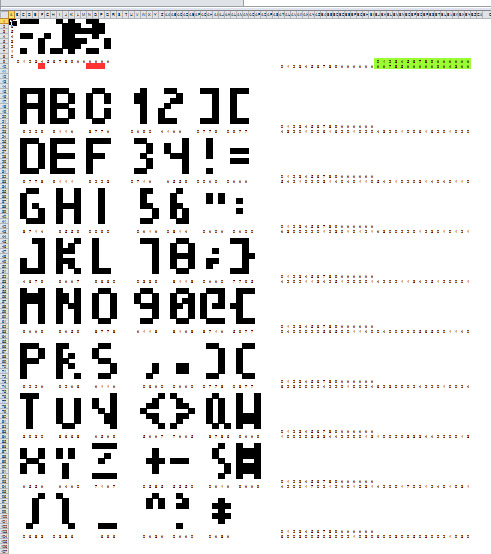 For 64 characters it is 128 Bytes for character generator and 16 Bytes for vectors, consuming 144 Bytes. Much better! I started by drawing vectors I would expect to appear most frequently. Yes, it&apos;s really calc from LibreOffice. At first I thought I&apos;m going to write script to generate the symbols from given input tables, but this was actually more straightforward and simpler. The first eight rows are just combinations of black dots at lines 1,4 and 7, the rest of vectors are the ones I expected to be common for alphanumeric symbols. I did my best to construct character table from it, though looking a bit weird. Some characters are rather hard to read, and I noticed vectors 4 and 14 are unused - wooohoo, two bytes for optimizations. Notice how numeric symbols changed, from the first iteration, along with letters like Z or G. I also introduced more ASCII symbols. In the meantime I ordered 122x32 pixel LCD with PT6520 driver and I&apos;m building new PIC board, to test out the character set. There should be some way to show which vectors are used the least.... So I&apos;ve added a count of the use of that vector on the top line. It will incorrectly pick up any mention of a number such as the label for the character 1, so be sure to label the numbers with "1" (in quotes) instead. And you can show which characters use each vector. E.g. I added a formatting rule that turns any cell with a $ red, then we can temporarily change the # which makes cells black into a $ in the vector and get a quick reference for which characters use that vector. I&apos;m going to have such fun messing with this... best puzzle game around! Thanks! If you modify vector #10 to darken in bits 3 and 5, it will improve the appearance of the "3" and the "B", then you can change the last nibble of the "C" to use #7 for the last vector which will still look fine. As far as I can see, vector #6 is only used for the last nibble of "R" so why not turn on bits 2, 5 and 6? It would really improve it. Can you share your source file? The spreadsheet? I want to play with this. Yes, I uploaded it into files section right now. Thanks, I changed it as per you input - the K is affected too, as well as < and > and #. I have to decide which one to keep, but your suggestion is actually pretty good too, thank you! Wow, pretty awesome! How much code does the vector lookup and character generation take? Wondering if its something that I could borrow for OKOS, right now I&apos;m using 40 glyphs from the 3x5 font in 80 bytes, with another 50 bytes to do table reads, unpack, and send to i2c to a rom-less oled display. Thanks. My font + display routines are going to be slightly bigger in consumed bytes, but I really wanted font larger than 5x3 :-) Perhaps it is not suitable in unchanged form due to constrained FLASH budget of your project, you may try to adapt similar compression scheme for OKOS, though. Currently, the tables for 64 glyphs take 144B, the unpack + display routines will be small, I assume something like 20-30B. Due to simple compression scheme, unpack is nothing more than nibble swap and table read. The display routines are not yet on github, I&apos;m working on it; the display took longer to arrive than I anticipated. Anyway, 5x3 or 4x4 fonts are possible solutions too, I just wanted to achieve another way to achieve the goal. I wonder if it would work better with a 3x5 font. Normally it&apos;s 2 bytes per character, but with your approach, that could be greatly compressed. Ah, sorry, that&apos;s the 4-color version, to get the 2-color, simply make the light gray white, and the dark grey black. I used 3x5 font in one of my projects (Z80 emulator running CP/M, not documented here yet). Problem is that such as low-res font can&apos;t tolerate any pixel changes - move one pixel and you get completely different character. My compression method is "lossy" - it relies on fact you can "bend" the character somehow and still get readable output. On the other hand, with 3x5 font you have less combinations of pixels in columns, so perhaps less vectors, not sure. There is possibility of other compression methods, not just vertical vectors, but one could try horizontal ones, or dividing the character bitmap into areas (by 2x3 pixels or something) and finding predefined sub-bitmaps here (the same as vector thingy, just not in single line) - or even combination of both. This is where optimizing in spreadsheet editor goes way too boring, some more software automation would be needed. At first I planned to write some software helper, but for this simple case spreadsheet was good enough. I wonder if you could just take a set of ready letters, and automatically split it into shapes that you would then XOR to get the letters. I can&apos;t think of a way to do that, other than solving a nasty set of equations modulo 2, though. This is great work! It&apos;s kinda like finding the Karhunen–Loève transform by hand. Well done.